Unmanned aerial vehicles (UAVs) provide an opportunity to rapidly census wildlife in remote areas while removing some of the hazards. However, wildlife may respond negatively to the UAVs, thereby skewing counts. We surveyed four species of Arctic cliff-nesting seabirds (glaucous gull Larus hyperboreus, Iceland gull Larus glaucoides, common murre Uria aalge and thick-billed murre Uria lomvia) using a UAV and compared censusing techniques to ground photography. An average of 8.5% of murres flew off in response to the UAV, but >99% of those birds were non-breeders. We were unable to detect any impact of the UAV on breeding success of murres, except at a site where aerial predators were abundant and several birds lost their eggs to predators following UAV flights. Furthermore, we found little evidence for habituation by murres to the UAV. Most gulls flew off in response to the UAV, but returned to the nest within five minutes. 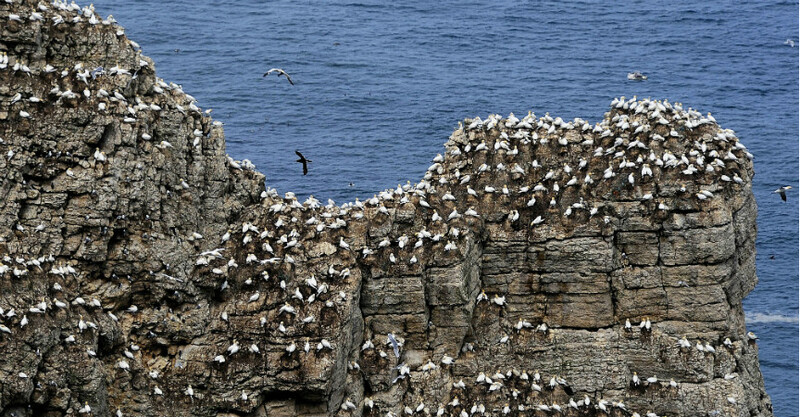 Counts of gull nests and adults were similar between UAV and ground photography, however the UAV detected up to 52.4% more chicks because chicks were camouflaged and invisible to ground observers. UAVs provide a less hazardous and potentially more accurate method for surveying wildlife. We provide some simple recommendations for their use.